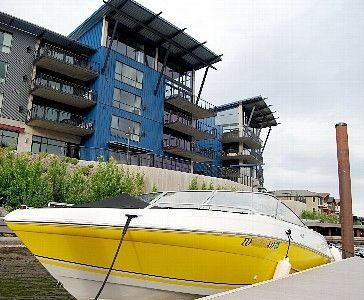 *Top quality waterfront condo right on the riverbank. Luxury, beauty, and comfort surround you. Brand new condo with all new furnishings and decor; fully equipped high-end kitchen for cooking great meals or just ordering in. *Breathtaking views in the daytime, peaceful comfort in the King and Queen beds at night. *Large balcony, glorious sunrises and sunsets; watch Osprey, Bald Eagles, and Kingfishers feeding in pristine Spokane river. *Canoe or kayak from the day-use dock into spectacular Lake Coeur d'Alene- among the world's most beautiful alpine lakes. *On-site Idaho Centennial Trail bike path leads to City Park for beach or Ironman (1.5 miles). *Located on the waterfront of the Riverstone Development, featuring restaurants, Starbucks, ColdStone Ice Creamery, shopping, Zi Spa, 14-screen movie theater, 10-acre Riverstone park lake with breathtaking 60-foot fountain. *40 miles of North Idaho Centennial Trail (see link below) pass less than 200 feet from your front door. *Free City Link Bus around town or to CDA Indian Casino (18 miles) and Riverstone Trolley to city beach, Coeur D'Alene Resort, or downtown. *Perfect location to warm up for IRON MAN half in June or full IM in August, commute to four ski resorts in January, or just relax with a great local wine any time. Summer: Local Activities *Boating and Water-Sports on Lake Coeur d'Alene. *Golfing at Premier Golf Courses- world famous Coeur D'Alene' Resort GC, Coeur D'Alene' Public GC, Hayden Lake CC, Avondale GC, Highlands GC, and more. Resort Shopping and Dining Downtown and at the Coeur d'Alene Resort. *Art Shows and Street Fairs; Live Music in the Park. *Lake Cruises, City Tours, Zip Lines, Fishing expeditions, and Tourist Activities. *Biking on the Centennial Trail and Hiawatha Trail. Winter: Close to four Major Ski Resorts. Silver Mountain- 30 Minutes; Schweitzer Mountain Resort- 90 minutes; Lookout Pass Ski Area- two hours; 49-Degrees North Ski Area- Two Hours; plus numerous scheduled Winter Holiday Activities at the Coeur d'Alene Resort and City Center. Fortunate to call CDA my home since 1961, and when fully retired from the Navy, we'll be back permanently. Love the Centennial Bike Trail going right by our front door, and we can ride to Old Downtown CDA, out around the lake, or even all the way to Spokane. Most of the trail follows the river or the lake- it's absolutely gorgeous. Lake Coeur d'Alene is one of the most beautiful alpine lakes in the world. Outdoor adventure paradise. Small town atmosphere with friendly folks and excellent recreation and dining options. Refreshing crisp Rocky mountain air. Just a great place to be. Love waking to the gorgeous sunrises, sitting on the balcony and seeing the bald eagles and osprey cruising the river for breakfast. Often stroll to nearby Starbucks for mocha and a scone, then back around the Riverstone Park Lake. It's so peaceful we always depart fully rested, and can't wait to return. Master has tub/shower. Guest bath has glass shower. Numerous excellent golf courses nearby. Gym onsite- small gym near elevator with treadmill, stairstepper, and cycle. What’s not to love about this place? Comfortable beds, all the cooking essentials you need, great location, and a fantastic view. The fireplace was really nice in the evening. Although the parking under the building is really tight, I recommend parking in the parking lot. I ended up arriving a little early and they allowed me to check-in since the place had already been cleaned, and check-in was super easy. I would definitely recommend William’s place and would stay here again. We had a wonderful stay! Loved every minute of our stay. The condo is beautiful inside and out. Lovely decor, well stocked, comfortable furnishings, and peaceful views! Easy booking and excellent communication with owner. Great condo with an incredible view!! We enjoyed our week in CDA at this wonderful condominium. It has everything you will need to have a great time. Very clean and well stocked. For a traveling business person this place was amazing. To be away from home for 3 weeks is a tough thing to do but to have a home like space to stay in makes it so much easier. This place was beautiful and communication with the owner Bill was excellent, I would highly recommend it to other professional travelers. We had a great time staying here. The location is great. The condo is very comfortable, clean, nicely decorated and the view is amazing. The owner is very nice and accommodating. We will definitely stay here again. This condo is so great we never wanted to leave it! It is tastefully decorated and has very modern features. The kitchen is a dream, with jenn-air appliances. The owner thoughtfully keeps the refrigerator water filter up to date so you can use the ice and water; no more buying mass quantities of bottled water! The view of the river is wonderful. Everything you need to have a great vacation is here. This is the only place to stay while in Coeur d'Alene. Bicycle- steps from the paved 40-mile long Idaho Centennial Bike Trail. Check-In: 4 PM Check-Out: 11 AM No Pets, No Smokers Quiet Hours 9 PM- 9 AM Max Occupancy: 4 Full Refund for cancellations at least 60 days in advance.